The Object Lives project explores the trajectories and changing meanings of objects moving across cultures and global spaces. How we do this has proven to be a development of the team’s collaborative approach and a distinct and exciting research methodology. The ‘discovery process’ we used at the Pitt Rivers Museum in 2015 is still developing, and we comment on it in this series of images and captions. We look forward to refining it at the McCord Museum workshop in 2016. Before the team met at Oxford, we discussed and shared our goals for object-based study, got to know each others’ areas of expertise, and worked to decide what kinds of objects would be useful to examine together, where the overlaps and gaps in our knowledge would provide exciting discussions. Once we were all in the room with the objects, we realized that not only were many people contributing to discussions, extending (and querying!) sets of knowledge, but that different perspectives enhanced the overall richness of discussion. We also engaged in ‘close looking’ with objects—like the classic literary method, ‘close reading’—making close physical examination the basis for observation, reflection, querying, bringing knowledge and perspectives together, and generating further research questions. We brought items out in related groups where possible, to spark comparisons across objects. This picture shows garments from the PRM collections, waiting in the research room for the Object Lives team to come and think and talk about them. The blue wool coat and leggings and hat are Wendat, c.1830; the flared hide coat with cloth trim is northern Ojibwa/Cree/Metis, c.1800-1830; and the quilled and painted hide coat on the right is northern Plains/Parkland, c. 1820. The coats are all very different in cut and decorative treatment, and helped us to think about the specifics of local histories which created them and the broad similarities of European/Aboriginal contact in which they all emerged as hybrids of European and Aboriginal design. The power of the coats is apparent, from their creation to use(s). Photography is one way of focusing on the details of objects, really ‘seeing’ them in order to think about them. Wendat scholar, Jonathan Lainey, specializes in Wendat items and especially in wampum, but helped the team by bringing his photographic skills to bear on all the objects we considered. Here he is participating in a conversation about the fancy brocade trim on the hide coat. We wondered what kind of fabric to call it, and decided that we could Photoshop images of it together to make a larger image and thus help to identify it. The brocade trim, along with the plain twill wool lining of the coat, may have been added at a later date, possibly after the coat was taken to England by its collector, so identifying this fabric might help us to think about the coat’s history and the different people who may have contributed to its manufacture. From left to right: Anne Whitelaw, Katie Pollock, Susan Berry, Laura Peers, Sarah Nesbitt, and Jonathan Lainey. Collaborative research processes benefit individual researchers as well. Here Sarah Nesbitt, MA Student and Research Assistant with the team, is learning about the Wendat garments by working with Jonathan Lainey, a specialist in Wendat material. We each learned to ‘see’ certain features of objects, to look for particular things about objects, and thus to link materiality to history, by taking notes for each other or by photographing or looking things up online while we were all together in the research room with the objects. Also pictured from left to right: Sarah Nesbitt, Luke Pepera, Anne Whitelaw. 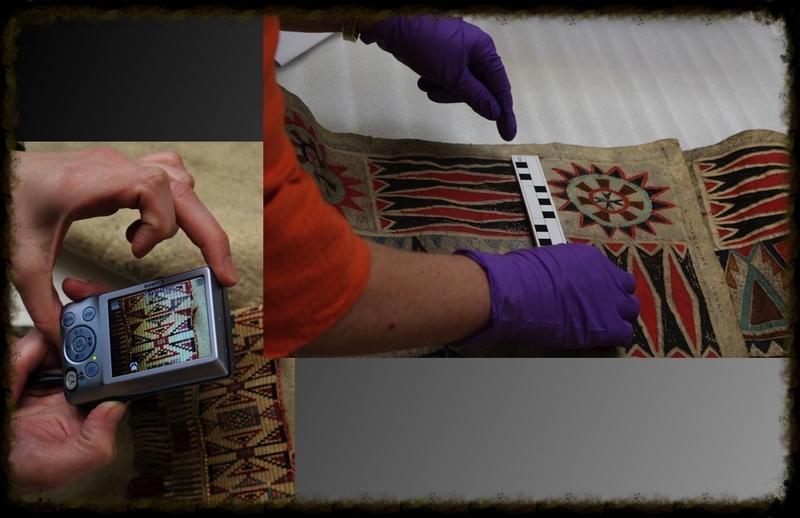 The team had the benefit of considerable assistance from PRM conservators who are able to gently turn objects over (and sometimes partially inside out) so we could see seam details, places where dyes have not faded, and construction features. Here conservation intern Naomi Bergmans helps the team to see the underside of the hood on the Wendat coat. From left to right: Sarah Carter, Katie Pollock, Susan Berry, Anne Whitelaw, Jonathan Lainey, Laura Peers, Sarah Nesbitt, Cynthia Cooper, and Naomi Bergmans. Patternmaking 101: one of the ways to understand the ways that hybrid objects are constructed, what their heritage is, is to make actual patterns so we can see the structure. Team members carefully measured this coat to create an accurate pattern from it to compare with other coats of similar vintage. Was this made by a European tailor at a trading post? By an Aboriginal or Metis wife of a trader? How did elements of tailoring adapt to hide garment construction? Each team member requested items they wanted to research and objects on which they could contribute expert knowledge to the team research. Sara Komarnisky is a postdoctoral fellow with the Object Lives group and is focusing her work on objects produced by Indigenous patients in tuberculosis hospitals. PRM brought out a loom-woven beaded belt collected in Minnesota in 1939 from a TB sanatorium for her to think with. One of the benefits of collaborative research is being able to mentor young professionals, as well as to gain from their knowledge and enthusiasm. Long close looking is a key component to the Object Lives group’s methodology. Over the course of our visit, it became clear that modes of looking are informed by disciplinary training and knowledge and that the cross-disciplinary make-up of our team yielded important and unexpected discoveries. Here, anthropologist Laura Peers of the PRM holds a Plains Cree gauntlet for inspection by textile specialist and garment historian Cynthia Cooper of the McCord Museum, while historians Sarah Carter and Jonathan Lainey look on. Cynthia’s knowledge of European and Euro-North American practices of garment making and tailoring were instrumental to our ability to think through the exchanges of knowledge and practice that produced these gauntlets. From left to right: Susan Berry, Sarah Carter, Laura Peers, Cynthia Cooper, and Jonathan Lainey. Long close looking requires attention to all parts of an object, not simply the beautiful patterns and details that were made for public display. Here, the underside of a Wendat saddlebag is examined for what it reveals about fabric, construction, and wear – all key elements to understanding how an object would have been used. This attention ensures that we consider the life of the object and its role in the day to day activities of its user(s), not simply how it might resonate aesthetically. Thinking about these objects, we work to see the full range of material evidence and also see beyond the visual. We recognize the agency of objects throughout their ‘object lives’. We also look to identify the things we can’t always see, bringing together questions from the material evidence and our wider knowledge. Cross-cultural, trans-Atlantic, cross-disciplinary research: Judy Half, Aboriginal Liaison Officer, Royal Alberta Museum, has thought about dewclaw bags, a form of Aboriginal art, for some time and brings her expertise and Aboriginal perspectives to understanding a similar kind of bag in the PRM collections. Here she is explaining features of the bag to the group and to Museum staff. Faye Belsey, at left in purple gloves, is taking notes on a printout of the Museum’s record of the bag to add to museum understandings of it. Faye has assisted in other group research visits to the Museum by Haida and Blackfoot people, so is familiar with the many perspectives and ideas swirling around the table. But we, of the PRM, were all amazed by how much information we had when we began overlapping sets of knowledge—and by how this overlapping actually sparked new questions for research. From left to right: Faye Belsey, Naomi Bergmans, Judy Half, Katie Pollock, Jonathan Lainey, Laura Peers, Laurie Bertram, Cynthia Cooper, and Sarah Nesbitt. Long close looking is supplemented by writing and recording. Here, Julie-Ann Mercer, MA student and Research Assistant to the team, records Judy Half and Katie Pollock’s combined visual analysis of the Cree dog blanket, part of the harness furnishings. Katie Pollock is a doctoral student and RA based in Edmonton and shares their passion for the material culture of indigenous peoples of the northern Great Plains. These recorded conversations and observations then form the basis for further discussion and analysis by team members, but also by other researchers once this information is posted online. From left to right: Katie Pollock, Judy Half, and Julie-Ann Mercer. Central to the Object Lives team is collaborative learning and mentoring. Team members come from many disciplinary locations and institutions, and each brings a different perspective and set of questions on the objects under consideration. The inclusion of senior and emerging scholars in the group also provides important opportunities for mentoring. Here, Susan Berry, curator at the Royal Alberta Museum, who has worked with northern Plains Indigenous items for many years, explains features of the quilled coat to Katie Pollack. Not knowing and asking questions: in a number of cases, team members had more questions than answers about particular objects. This openness to “not knowing” allowed the discovery process to develop most productively and foregrounded the centrality of long close looking. Here, Susan Berry, Beverly Lemire and Laurie Bertram, scholars with diverse knowledge bases, engage in a wide-ranging conversation around a Plains padded horse saddle. From left to right: Susan Berry, Beverly Lemire, and Laurie Bertram. This painted and quilted coat has a ‘twin’ at the British Museum. Were they actually made by the same woman? Or by the same family? How similar are the painted and quilled areas of theses coats? How do these decorative elements compare with other coats from the region and period? How does the cut of the coat compare to Metis coats, or to earlier T-shaped coats from Hudson’s Bay, or to European frock coats? What do the painted elements mean? Photographing, measuring, drawing are all ways to think about an object, to ‘see’ it, and to both ask and answer questions. Doesn’t’ quite fit….Embodied learning is important with garments: how do they hang? How could they have been used? What tasks were they made for and how does this show on the body? Making items also exposes aspects of what we don’t understand about objects. Using a pattern traced from a hide coat, Laura made a mockup in synthetic landscape fabric to explore the ways in which the tailoring of the item was European and how it was also affected by materials (hide) and Aboriginal sewing traditions. Laura Peers (left) adjusts the garment. The “feel” of the object also elicits significant knowledge. A significant benefit of the workshop at the PRM was the ability to interact with the objects, to touch them (albeit wearing gloves) and to get a sense of their weight and how they might have felt on the body. Here, Laura Peers picks up “Mr Magnificent”, a painted coat made from hide. It is surprisingly light, yet retains a solidity and structure that differentiates it from euro-North American cloth coats. What would it be like to wear such a coat? How would one adapt one’s movement if wearing this garment? What kind of sound would it make on the wearer? These are all key questions to understand the lives of the objects we are considering. From left to right: Laura Peers, Judy Half, Sara Komarnisky, Julie-Ann Mercer, and Sarah Nesbitt. Jonathan Lainey talks about wampum belts, about the making, using and politics of wampum belts (past and present) with the rest of us thinking along with him and contributing bits of information and questions. These conversations in the provocative presence of objects are at the core of the collaborative object research process. Here we have historians of material culture and of Aboriginal people and Canada; Aboriginal community-based perspectives; anthropology and material culture specialists; art historians and students. Both the overlaps and the gaps across our sets of knowledge brought us continually back to the object and then moved outwards from it as we asked new questions of the object and of each other. From left to right: Judy Half, Sarah Carter, Laura Peers, Jonathan Lainey, Cynthia Cooper, Beverly Lemire, Anne Whitelaw, Sara Komarnisky, and Sarah Nesbitt.